Everybody knows that God allegedly struck people down in wrath in the Old Testament. We find dozens of instances in the Torah of God dealing out judgment in the form of illness or death, both on foreign enemies (Pharaoh & the Egyptians) as well as his own people (Sons of Korah, the snakes, etc.) for their sins. The pattern continues on through the historical prophets, as well as the the literary prophets. In text after text we see God prove that he both “kills, and makes alive” (Deut. 32:39; 1 Sam. 2:6), as he executes his righteous rule over the earth. Of course, that’s the Old Testament. It’s now quite common to assert something along the lines of “Well, though the OT was really inspired (to a point), the fact of the matter is the OT authors were confused on some realities when it comes to God. How do we know this? Well, Jesus. I mean, Jesus is the fullest revelation of God, who does whatever he sees the Father doing, right? So Jesus never killed anybody nor did he teach anybody to kill anybody. Therefore, we know that God’s not the kind of God who would kill anybody or ever command anybody to be killed like we see in a number of OT narratives and legal passages. Now that Jesus came, we can overlay Jesus’ picture on the OT and see clearly which parts get God right and which don’t.” Or something like that. This is the sort of thing Andrew Wilson has dubbed the Jesus Tea Strainer hermeneutic. I’ve dealt at length with this sort of logic before in a few places myself, dealing with the problematic theology of revelation, hyper-pacifism, and it’s contradiction of Jesus’ own views of the Old Testament. Once here with respect to some unfortunate things Brian Zahnd said, and a second time with respect to Steve Chalke and Sabbath Sticks. Still, it’s worth pursuing the line of thought from another angle. You see, it appears to me that if this logic were true, then the New Testament writers who had seen Jesus wouldn’t have gotten God wrong, right? I mean, they’d seen him face to face and received the New Covenant blessing of the Holy Spirit in union with Christ who would reveal all things to them, right? And anybody being discipled by them in subsequent years who also wrote inspired Scriptures should have that gift as well, right? So then, if any biblical writers might be expected to get the totally non-violent nature of God right, it would be the New Testament writers. But a man named Ananias, with his wife Sapphira, sold a piece of property, and with his wife’s knowledge he kept back for himself some of the proceeds and brought only a part of it and laid it at the apostles’ feet. But Peter said, “Ananias, why has Satan filled your heart to lie to the Holy Spirit and to keep back for yourself part of the proceeds of the land? While it remained unsold, did it not remain your own? And after it was sold, was it not at your disposal? Why is it that you have contrived this deed in your heart? You have not lied to man but to God.” When Ananias heard these words, he fell down and breathed his last. In this dark and disturbing story we see the judge of all the earth disciplining his church. 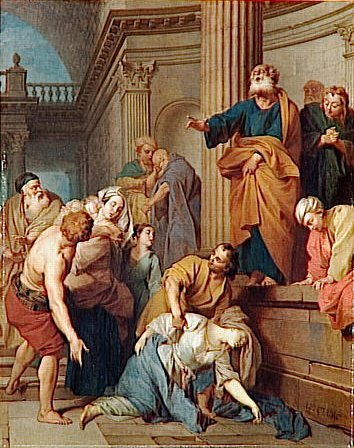 Ananias and Sapphira greedily and foolishly conspired to lie to the church about their giving and in doing so lied to God himself, bringing down his judgment. Now, of course, it’s possible for you to try and speculate as to whether both Ananias and his wife both just so happened to have cardiac failures on the same day, in the same situation, (shared eating habits & whatnot), or you can accept it in line with the revelation of the OT as the hand of God. Just as in the Old Testament, the Lord strikes down a tyrant who has been oppressing his people for his pride and arrogance. If in the last story Luke left the author of judgment anonymous, here he explicitly names him: “Immediately an angel of the Lord struck him down…” Now again, if you want to go about speculating as to whether this was a rogue angel, prone to disobey God, who nonetheless goes about defending his name…well, that’s your prerogative. It seems clear enough from the context, though, that this is to be taken as a divinely authorized judgment–angels are “messengers” bringing God’s righteous message here. Of course, it’s worth pointing out that in both cases Jesus’ followers are not the ones executing judgment. A pacifist reading of these texts is totally possible; I don’t mean to settle that issue here. What I will say is that unless you want to go around calling into question the New Testament’s revelation of the character of God as well, then you have to have an amazing level of confidence in your ability to distinguish the really inspired bits from the not-so-inspired bits–one that I’ll admit I simply don’t share. This is especially the case when I consider that the inspired author of Acts is also the inspired author of one of those Gospels I’m relying on to get my picture of the non-violent Jesus who points us to a God who never violently judges people. Now, this may not be enough to convince you, but I do hope it at least slows you down from the overhasty judgments about Jesus & the OT we’ve been seeing lately. Buying into these claims means biting off, chewing up, (and eventually spitting out) a bit more than you might have anticipated. ← Is There Such a Thing as ‘Moral Orthodoxy’? It seems to me that a God of active vengeance is the best grounds for non-violence on our part. He takes care of the justice/judgment/retribution so we don’t have to and ought not to. That seems to be the best NT logic. And -someone please correct me if I’m wrong here- was it not the tack taken by the earliest Anabaptists? I don’t know why anyone would want to reason away a good piece of theological equipment for not acting violently or retributively? Volf makes that case brilliantly and better than anybody else I’ve come across in the last couple chapters of Exclusion and Embrace. That’s exactly right. It’s why the Apostles use language of war and fighting, but have reconditioned it for the real battle which is fought with love and righteousness, not swords and bombs. It’s why zealots would flock to Jesus, and yet be confused. Pointed example is when Jesus tells John and James that to consume a town in flames is of a different spirit. Casting out demons and binding the broken are the real marks of war. What is confused is that the wrath of God is cut out from and separated from the cross-bearing Lord. John sees the wrath of the Lamb and it ought to suspend macionite pacifistic interpretations and Pharisaical hell-fire preachers. Both posit either a schizophrenia in God (with talk of balancing holiness and love) or a Jesus who is not YHWH. Jesus told Peter to throw the sword away and He rejected the Devil’s offer of the kingdoms of men. Too bad many who’ve been known as church have done the opposite. For some, they’ve crucified the Son of God again with their treason. Also, Jesus cleaning the temple is an instance of He himself judging. If the Creator of heaven and earth, who knows every secret thing, can read our thoughts and knows more about our motives than we ourselves, isn’t qualified to dispense judgment, he’s not God at all. It’s the height of arrogance for a mortal to sit in judgment on God. The historical narratives of the OT are bare bones journalism. They mostly detail visible events, not the deepest thoughts of men. It’s a poor theology that doesn’t allow for the unknown. I think perhaps the root of some of our current angst with God is rooted in insisting on caging God in a system of hermeneutics that doesn’t allow God’s very nature or Holy Spirit wisdom to influence interpretation. ‘Apart from’ the grace and mercy shown to us in Christ Jesus, God might as well be the devil. Today there appears to be no end of re-hashing old misunderstandings. It seems the rise of the modern-marcions is upon us. God is jealous over His called ones. The killing of Ananias and Sapphira was not only judgment for lying to the Holy Spirit. It was also protective. That early group of believers was so frail and young in the Lord. He just couldn’t tolerate that kind of behavior taking root in the rest of the Body of Christ. And Peter was exhibiting the gift of the Holy Spirit called “great faith” when he pronounced God’s judgment on those backsliders. It is a gift that can be given to any believer who asks for it…and we so, so need it in this day, just as it was needed then. Liars abound in the church…even today. I always tell folks to turn to Acts/Revelation when they argue for some kind of discontinuity between the ‘God of wrath’ of the OT and the ‘God of love’ in the NT. I can’t see why, if someone believes that God couldn’t be bothered to make sure His people got the facts straight in certain parts of Scripture, He’d be bothered to make them get the facts straight in other parts – including the bits about Jesus being the exact imprint of His character. Interesting post as always Derek. Are there any books that you would could recommend that address this? I have read Copan’s book and David Lamb’s book that speak to addressing the OT context and enjoyed them. I am looking for books that speak more directly about the “Jesus hermeneutic” from a more evangelical/conservative point of view. It seems to me that they start off well but then go too far. The article you address seems similar to an argument made by Kenton Sparks in his books a few years ago. It seems this idea is gaining traction and popularity, at least to some degree, and I would like to read something that defends a more traditional view. Thanks! Yeah, see, this is why I couldn’t even be a liberal Christian. I find conservative views repugnant, but there’s a consistency to them I can respect even as I most gleefully reject. I’m not unsympathetic to the progressive types in their quest to salvage God’s character, but it’s always seemed like a doomed effort to me. You shouldn’t need another book or a blog to get what God’s really all about, right? Are you as open to the possibility of this sort of judgment on those who are born again and have not renounced their faith?